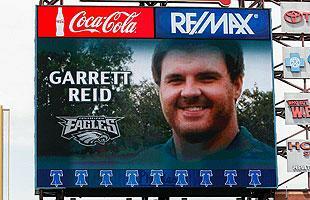 Within roughly two minutes of hearing about Garrett Reid's death, I picked up the phone and told my sons I love them. Then I trembled a little with equal parts grief and fear. 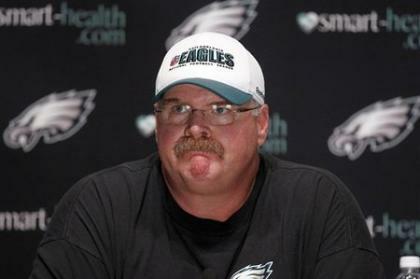 I can't imagine being Philadelphia Eagles coach Andy Reid right now and I hope I never feel that pain. Reid awoke on Sunday morning to find out that his 29-year-old son was dead, found in a dorm room on the Lehigh University campus where the Eagles are holding training camp. There is some "rest of the story" that will come out in time. Garrett Reid had his share of demons involving drug abuse, which may or may not have factored into his death. Really, though, that's just a bunch of details at this point. The inescapable feeling is some variation of muted sorrow. Or as Cleveland Browns offensive coordinator and longtime Reid friend Brad Childress said Sunday when reached in his office: "I'm having a hard time getting my head around this one. I'm sorry, that's about all I have to say." What Reid has to do now is bury his son and then, in some sad likelihood, bury his emotions. He has to compartmentalize them into some private place where only a few get to see. He has to pretend that he can somehow focus on football and be the leader of the Eagles, who start the season in just five weeks. The football world doesn't embrace sorrow very well. It's just like the pain of an injury. You're supposed to shake it off, but most people struggle. Inevitably, there will be some talk about whether Reid should take time away from the team. There will be some discussion of what effect this will have on the organization and the players. In 2005 and last season, the tragic late-season deaths of Tony Dungy's son James and Joe Philbin's son Mike, respectively, preceded early and surprising playoff losses for a pair of teams considered Super Bowl favorites. Conversely, the 2003 Green Bay Packers advanced to the second round of the playoffs after assistant coach Ray Sherman lost his son in May. A year earlier, the St. Louis Cardinals overcame the death of pitcher Darryl Kile in June to make it all the way to the National League Championship Series. "It's hard to be normal when something like that happens," Packers wide receiver Jordy Nelson said earlier this offseason when asked about the Philbin situation. "Joe didn't come in looking for sympathy or anything, but you know it's there. You don't know what to say right away. In the back of your mind, you're thinking, 'Is he OK?' "
For Reid and the Eagles, they're caught somewhere in the middle. They don't have to play a meaningful game for awhile, giving everyone some small bit of recovery time. At the same time, this is the point of year when they have to be focused on the task at hand. Tiptoeing around the head coach doesn't make for the easiest situation. For years, Reid has been considered a good communicator with players. He and his players have been open with each other about how to correct issues and deal with problems. "Andy is always going to have the final say, but he wants to know what the players are thinking," former Eagles backup quarterback A.J. Feeley said. "He wants your input, even when things are tense." The concern has to be whether that's compromised in some way. Can Reid and his players find a way around this tragedy to keep the lines of communication open as the season unfolds, particularly when things are going bad? For now, there's no real way to answer that question. When the time is right, Reid can think about how he'll handle it. The players can think about what they will do. But only the somber reality of time together and how long it takes to heal will determine when the Eagles can get back to normal. In the meantime, all the words of condolence from around the NFL are like so many fallen leaves in autumn. In some sense, they're pretty, a final bit of color before the harsh winter. In a greater sense, just a meaningless layer of debris that has to be cleared away in order to deal with what's going on underneath. That's the sad reality that Reid will have to face in the coming days, weeks and months. All while trying to run a football team in a sport that waits for no one.